Topographic surveys and site map creation. Depth-to-bedrock studies, water table studies and buried service detection. By mapping a farm’s topography, we can create contour maps and produce three-dimensional models showing where water will flow (watershed analysis). Topographic data can also be collected over time and compared to determine soil erosion rates. Maps are provided in both electronic and printed form. We can also produce site maps showing the location of specific fields, structures, etc. An example topographic image map showing a higher area (in red) surrounded by cliffs. Note that site coordinates have been removed for privacy reasons. 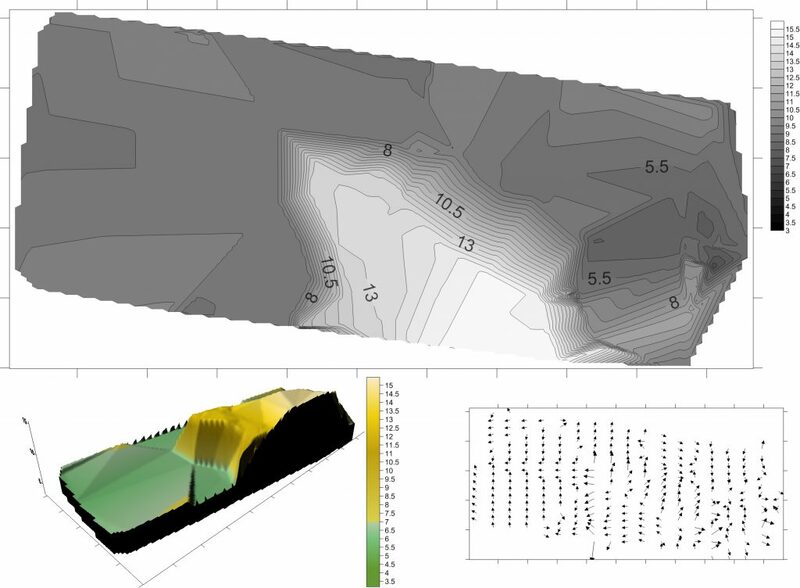 Alternate display options for topographic data include contour maps (top), 3D surface view (bottom left) and slope direction (bottom right). 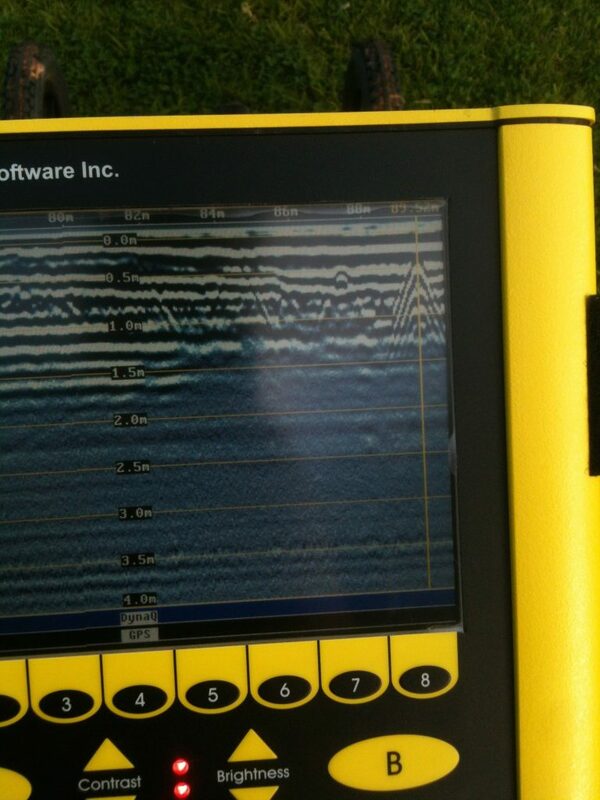 We use ground-penetrating radar (GPR) to determine the depth to local bedrock and water table across a farm site. The end result is a map showing variations in the depth to these layers across the site. Topographic data is also collected while collecting ground-penetrating radar data and can be used to create topographic maps (as above). GPR data can also be analyzed for the detection of aquifers, sinkholes and buried services (pipes and cables) – typically at no additional cost. 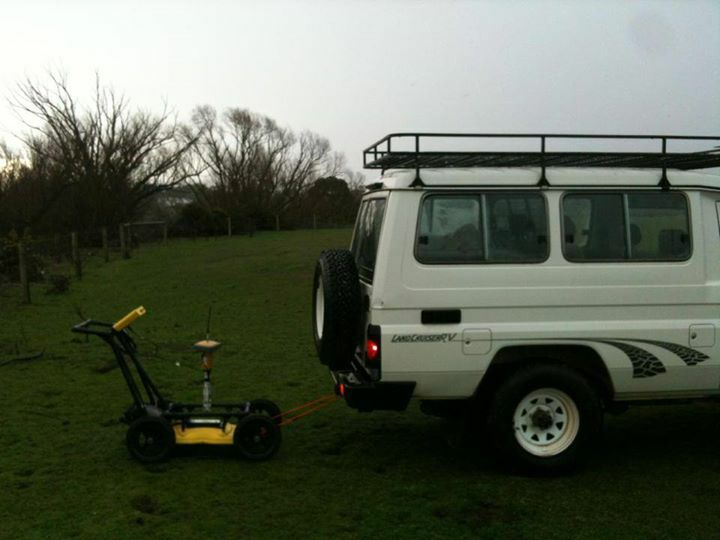 Using ground-penetrating radar to map the depth to the water-table and bedrock on a farm near Ballarat, Victoria. Mapping depth to the water table using ground-penetrating radar. The water table is about 1.5m below the ground surface. Additionally, Hunter Geophysics recommends electromagnetic (EM) surveys (useful for determining the concentration of clay, salinity and moisture in soils). Electromagnetic surveys for agricultural purposes are conducted by our friends at FarmingIT. Mapping and topographic data is typically collected with a real-time kinematic GPS unit, which provides mapping precision within an inch (2.5cm). All data is supplied to the client along with a survey report. Data collected by Hunter Geophysics is archived for future reference or for providing re-prints. 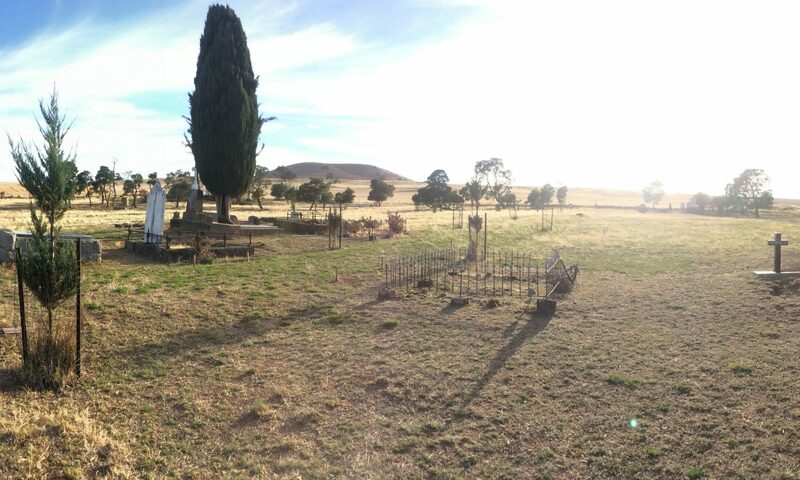 Hunter Geophysics complies with various quarantine restrictions (e.g. phylloxera).